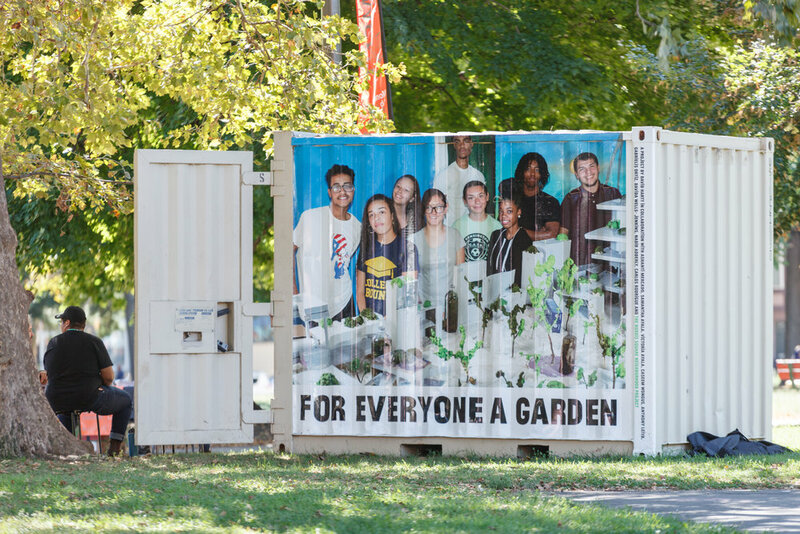 David Hartt worked in collaboration with the Norris Square Neighborhood Project (NSNP), an organization that provides green space and youth education for residents of North Philadelphia. 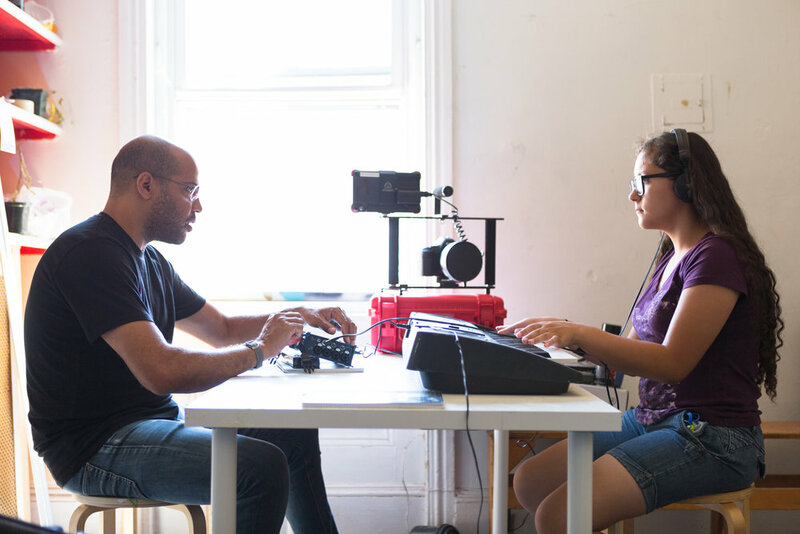 In particular, Hartt partnered with youth from NSNP’s Semillas del Futuro summer program to create a film that explores the connections between city planning, community gardens, and civic engagement. Hartt was initially inspired by NSNP’s gardens as a connection to Philadelphia’s founding vision as a “Green Country Town” and to the neighborhood’s long-standing investments in greening. Hartt set up a studio in the NSNP building on North Howard Street, adjacent to Norris Square. During the production process, Hartt and his collaborators constructed a room-sized model of the neighborhood, and asked, “Who participates in the process of making a city and a neighborhood and how can we imagine a more inclusive future?” To approach these prompts, the film imagined Norris Square in fifty or one hundred years. According to Hartt, the film is an inadequate monument to the time he spent working with the youth and their shared vision of a possible future. The film was shown in the Norris Square Lab, with a large image of the youth cohort with their model of the park installed on the lab’s north-facing outer wall. Partners: Mural Arts Philadelphia, The Pew Center for Arts & Heritage, The City of Philadelphia, Philadelphia Parks & Recreation, and the Norris Square Neighborhood Project. for everyone a garden VIII was presented as a part of the Monument Lab: Philadelphia (2017) exhibition. David Hartt creates work that unpacks the social, cultural, and economic complexities of his various subjects. He explores how historic ideas and ideals persist or transform over time. Born in Montréal in 1967, he lives and works in Philadelphia where he is an Assistant Professor in the Department of Fine Arts at the University of Pennsylvania. He has an MFA from the School of the Art Institute of Chicago and a BFA from the Department of Visual Arts at the University of Ottawa. His work is in the public collections of The Museum of Modern Art, New York, Whitney Museum of American Art, New York, The Studio Museum in Harlem, New York, The Art Institute of Chicago, Museum of Contemporary Art, Chicago, The Museum of Contemporary Photography, Chicago, Henry Art Gallery, Seattle, The National Gallery of Canada, Ottawa, and The Stedelijk Museum, Amsterdam. David is the recipient of a 2015 Foundation for Contemporary Art Grant; in 2012 he was named a United States Artists Cruz Fellow and in 2011 he received a Louis Comfort Tiffany Foundation Award.